Thank you so much, Karen!! What a wonderful surprise! I'm working on a baby quilt right now (that has to be done tonight), but I will try very hard to get a blog post up about this today. I am honored to have my name mentioned on your blog and beside the ladies of MOP! I hadn't realised that Karen - I'll have to go searching around in some March 2007 threads. How fun! 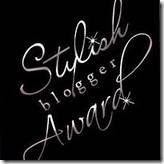 Okay...I have a dumb question...I want to put the "Stylish Blogger Award" button (is that even the correct word? I'm such a Luddite!) on my blog, but I think I need a link to just the pic? I am obviously confused, so any help you can give me would be greatly appreciated! Oh, I see what's wrong. You need to change the link to "http://outlandishobservations.blogspot.com/2011/01/stylish-blogger-award.html" so it points back to this page. The link is not working right now because you didn't include the "http://", so WordPress thinks you want to link to a page on YOUR site.